Shipping & Availability FREE shipping on your rear Side Window Deflectors when you purchase front Side Window Deflectors at the same time. FREE shipping on all additional Side Window Deflectors (for a 2nd, 3rd, etc vehicle) when purchased at the same time. WeatherTech Side Window Deflectors, offer fresh air enjoyment with an original equipment look, installing within the window channel. They are crafted from the finest 3mm acrylic material available. Installation is quick and easy, with no exterior tape needed. WeatherTech Side Window Deflectors are precision-machined to perfectly fit your 2002 Mazda Protege5's window channel. These low profile window deflectors help to reduce wind noise and allow interior heat to escape. Our light tinted Side Window Deflectors are the only deflectors in the world made with a D.O.T. (U.S. Department of Transportation) approved glazing material. Available in light and dark tint for most vehicles. Designed and Engineered in USA – Handcrafted in Germany. Very functional and excellent in the rain. Streamlined, low profile and subtle I love how they look on my Wrangler. It is a tight fit and the edges are sharp so you may want to wear gloves when installing. I did cut my fingers and had to wipe up some blood on them. Looked at many different brands but Weathertech IS the way to go. Amazing product and super easy to install. Only took about 10 minutes to install. I recommend this product! Have had the dark tint deflectors installed for several years on my 3-door Accent GS. Highway noise reduced, air flow in the car when it's raining, able to leave windows cracked in parking lots and they don't glue on like the cheap ones. Great investment, still look as good as new. Installed my window deflectors all by myself, lol. 2017 Toyota Tacoma. And they look great. Really easy to install. This girl can enjoy the sweet scent of rain fall without getting the cab doors and power window switches all wet. Super stoked! Pretty solid product. I also have the weathertech liners inside the car for my coupe and have the moonroof deflector as well. All 3 are great products and would all recommend them. Prices are solid and even though you can get cheaper ones from Amazon or EBay, they won't be as a perfect fit than these products. The rain deflectors were fairly easy to put on, you might have to re-adjust them to get them the perfect fit. The moonroof as well. You might need a partner on the other side to get it even on both sides. The liners are true to size so they'll pop on with ease. All in all, great products, but I wish weathertech made rear window spoilers. They seem to have amazing material so they can make it work. It'll add a sporty look on 2 or even 4 door cars. Hopefully they see this request. Typical rainguards are honestly hideous accessories on any car, however, the sleek look and fit of WeatherTech surprised all of my non-believing friends. It was easy to install and looks like a part of my car. Again, looks very sleek and smooth. Sooo worth the price, no other rainguard from any retail store will come close to how these look and feel. I got a Honda Odyssey I love the van but when I roll down the window water comes pouring in right off the windshield wipers right off the front window! Not just a little water, all the water! Thought I was going to drowned in the front seat. I got the Weather Tech deflectors After much searching cause they look better than the ones that the Honda factory makes. They installed easily, fit perfectly, and looked great! Most importantly they work wonderfully. I'd recommend them to anybody with the Odyssey van. I couldn't be happier! Job well done . Very easy to install. Look amazing on my black crew cab very sleek looking. Do Side Window Deflectors stop wind noise and whistling? The Side Window Deflectors may help reduce wind buffeting when the windows are opened, but does not entirely prevent it from occurring. Why are the rear Side Window Deflectors coming loose, even with rear clips installed? If the rear Side Window Deflector is loose, the clip is most likely not properly installed. More than likely, the clip is in the wrong position which is causing the deflector to become loose. Are side window deflectors available in a dark tint? 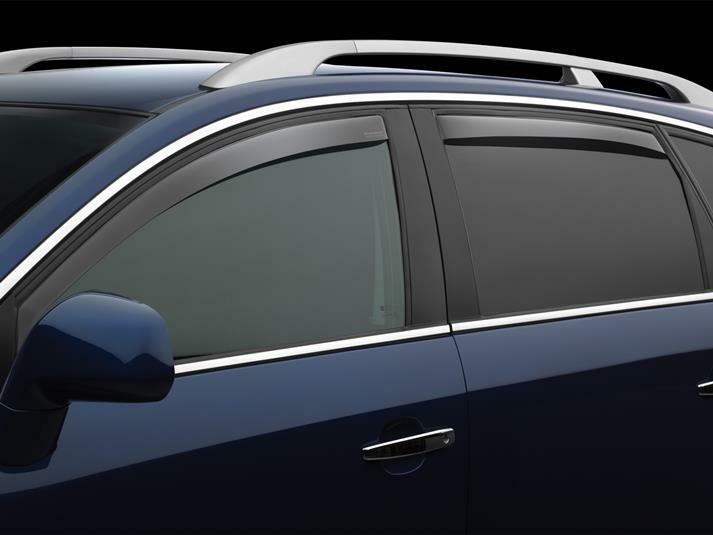 Most Side Window Deflectors are offered in a dark tint and light tint option. Older models are only offered in the light tint. What holds the Side Window Deflectors in? Our Side Window Deflectors install directly inside the window channel and are held in place by tension (without the need for any exterior tape). Instructions do vary by model, and we recommend that the customers follow the exact instructions included in the packaging (as some clips are used for select applications).